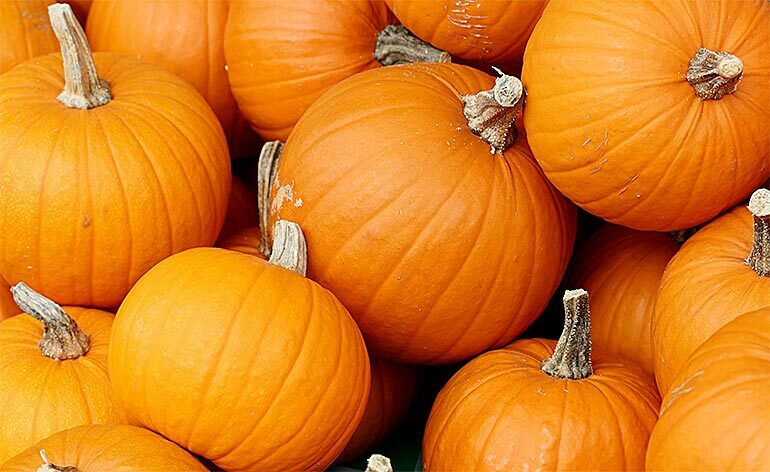 Home » Diet » Top 5 Health Benefits of Pumpkin! Pumpkin is a type of winter squash native to North America, and belongs to the Cucurbitaceae family (the same family as cucumbers and melons). They are usually forgotten about after Halloween, but these orange beauties are packed with nutrients and can be easily added to recipes year round. Read on to discover our Top 5 Health Benefits of Pumpkin! Pumpkins contain beta-Carotene, which is the phytonutrient that gives them their bright orange hue. Once digested, beta-Carotene is converted into Vitamin A in the body, which protects the cornea, helps the retina absorb light and improves vision in dim lighting. Just 100g of pumpkin contains 100% of our daily recommended Vitamin A requirement! Pumpkin acts as a great post-workout refuel – one cup of pumpkin actually has more potassium than a banana! (564 mg compared to 422 mg in one banana). Potassium is the primary electrolyte in your body’s cells, helping your muscles to function properly. Replacing it after a workout is important in order to prevent muscle cramps and fatigue. Potassium also has a number of other benefits – studies have shown that eating potassium-rich foods is linked to a lower risk of cardiovascular disease and stroke. Pumpkins are a good source of the minerals copper and zinc, both of which promote healthy skin and hair. Zinc maintains collagen, fights acne and helps the skin to renew itself. Pumpkin also contains the B Vitamin niacin, which promotes good circulation and helps to clear-up skin blemishes. The presence of protective antioxidants including beta-Carotene and alpha-Carotene can help to reverse UV damage and improve the texture of your skin. Eating foods rich in beta-Carotene may prevent free radical damage that can lead to cancer development, according to the National Cancer Institute. Foods that are high in Vitamin A are also protective against lung and oral cancers. Its very own seeds are worthy of note here: they are a great source of the amino acid tryptophan, which helps to promote sleep. Trytophan is converted to serotonin in the body, and then into melatonin, which is the hormone that regulates your sleep cycle. The seeds also have high levels of magnesium, a mineral that is associated with improved sleep. Don’t throw the seeds away when preparing a pumpkin. Scoop them out, rinse them and roast them with some coconut oil, sea salt and spices (at 180 degrees for ten minutes), for a snack to munch on the go! Try varying your post workout smoothie by adding a cup of steamed or pureed pumpkin, with a teaspoon of cinnamon for a pumpkin-spiced latte flavour! So there you have it – 5 reasons why pumpkins are good for more than just a Halloween lantern! Try adding pumpkin to soups, stews and curries for a tasty, hearty addition of orangey goodness. Got a great pumpkin recipe? Tell us about it below! 4 Reasons Why Women Should Lift Weights! 5 Foods IBS Sufferers Should Avoid!